As promised, a post about Dachshunds. In addition to watching Dogs 101: Dachshund and Meet the Breed-Dachshund in Youtube, I spent some time researching Nola's color. Nola has already told us she has a sable colored fur. Let me just inform you guys that "sable" means having a reddish colored fur with some black hair. Dachshunds come in a variety of fur color and pattern which is why they say "there is a Dachshund for everyone". 1. The name "Dachshund" literally means "badger dog". Yes, they also originated from Germany. In Germany, they are commonly known by the name Dackel. 2. The Dachshund was created by breeding a Pincher with a Basset hound which was then bred to a Spaniel and a wire-haired Terrier. ( Lol, Yuki, Rocket and Nola are practically ancestral relatives). 3. They belong to the hound family. 4. They were bred to scent, chase and flush out burrow-dwelling animals especially badgers, rabbits and prairie dogs. 5. Their lifespan ranges from 12-15 years. 6. They come in three sizes: standard, miniature and kaninchen (little rabbit). Kaninchen is not recognized by clubs in the US and UK. 7. 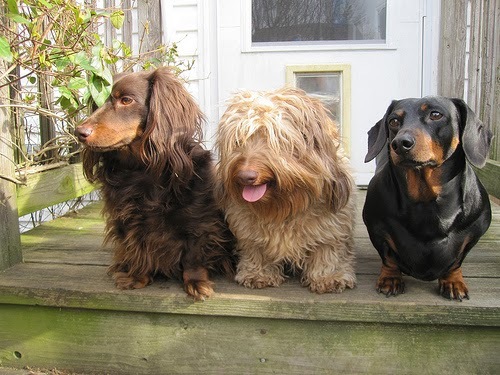 Dachshunds come in three coat types: smooth coat or short haired, long haired and wire-haired. Wire haired is the most common in Germany but it is also the least commonly seen coat in the US. 8. Their weight vary from 11-32 lbs while their height very from 5-9 inches. 9. Dachshunds are very clownish. They are mischievous, playful and stubborn. 10. They love burrowing, which means even the blankets will turn into a burrow when they get bored. 11. House training is an ordeal for a novice owner of this breed. He or she should have patience, firmness and determination. 12. Most books and information I've read about Dachshunds suggest that they are a very friendly breed. However, there are also statistical claims of them being aggressive to both strangers and other dogs than rottweilers. 13. They have loud barks and are great guard dogs as long as the culprit does not see how stubby and cute they are. 14. Dachshunds are prone to intervertebral disk disease due to their long spinal column and short rib cage. Be aware that jumping, running and intense exercises should be done at a minimum. 15. They are great apartment dwellers. I can't wait to talk about a new breed. But first and foremost, Nola's mommy mailed me a couple of supplementary information to learn about Dachshunds. I won't be able to include it here so I'll be doing a second post like a Q&A. I love watching and reading about dogs. And it's great discussion when owners augment on the ones I've already listed. Thank you, guys! Yeah, they love to burrow. We got our cats a burrow bag because we thought they might like it, but no deal. Boston is very friendly, and Nola is very picky about people she likes. It really just depends on the Dach. Dachshunds are the cutest! Great info. I love reading about the different breeds. Happy New Year! I love love love Dachshunds! And they are fun to draw! Thank you for the fun info about them! Happy New Year! I was glad to read that they're masters of Mischief too!! The more the merrier I say! Love reading about the different breeds. I have passed on the Liebster Award to you. You can check out my blog for the few requirements. Very Simple. Congrats! This was very interesting, I know almost nothing about Dachshunds, so it was great to learn. I think the Germans invented some of the best dogs :) I love how the German people treat their dogs as well. I lived in Germany and they are so dog friendly! It was not uncommon to walk into a restaurant and see a dog laying on the floor next the owner eating INSIDE the restaurant! If we ever get to live in Germany again, it will be a great place for Yuki and Rocket. Awww, such a cute picture, and some great info too. Okay guys, I'm a little overwhelmed by the number of replies. But I seriously appreciate everybody chipping in and commenting. @Rumpy: Your dachshunds are called cats? Or are we talking about June Buggie in a Dachshund suit? Lol. Just kidding. Cats are sometimes picky, too. Some prefer the scratching post or the squeaky mouse rather than a burrow bag. @Nola's Mommy: I see, but I've noticed that Nola seems to be the model-ish type. By the way, I will be adding your email here but I haven't had the time to edit it yet. My beau got sick the entire new year so I was playing nurse. @Bassetmomma: Thanks for the Leibster. I've read the rules twice. I hope I do it right later. Learning about other breeds is a great way to increase our knowledge about dogs. And there are more than a hundred breeds. @Y&R: Agreed. Germans make the best breeds. Of course, I don't mind saying the same for the Chinese. They've also created pretty interesting doggy combinations. You've visited pretty much a lot of great places in your life. 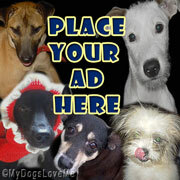 You should talk about it and share your doggy experiences in each place with us. @Snoops: You're up to mischief again?!? Lol, I wonder how your Monday would turn out if you had a Dachshund for a playdate. @Magic: That's too bad. I thought it would be an interesting home remedy. Maybe it's a case to case basis. @Pinkpixie: Hi! Happy New Year to you too. Thanks for dropping by. I went to your blog and commented with a question. Can't wait to visit Vanilla Bean again. P.S. I wasn't able to read about Keanna yet. Thanks so much for stopping by my blog to wish me well! I had some wired standard dachshund that I used to judge in earthdog. Lovely dogs, amazing workers! @Pip: No worries, you're one brave little dawgy. I hope you get better soon. @Tegan: I know what you mean, when burrowing, they're the funniest to look at.